Soho’s not an area that struggles for hip eateries, but the launch of The Palomar at the scruffy end of Rupert Street just a couple of weeks ago has already made it that little bit cooler. Brought to us via Israel, The Palomar is a spin-off from Jerusalem’s Machneyuda, by far the city’s trendiest spot and quite possibly the country’s best restaurant. Buzzy and young, it has made a name for itself for taking traditional Israeli dishes and serving them with international twists, as much as it has for being a cosmopolitan beacon in a firmly conservative city. The Palomar is brought to us by Layo and Zoe Paskin, the anything-but-conservative brother and sister duo who also gave Londoners The End nightclub, which closed in 2009. But three chefs hot off the plane from Machneyuda are also partners, while head chef Tomer Amedi is fresh from the kitchens of the original, so its not surprising that the restaurants have a lot in common. 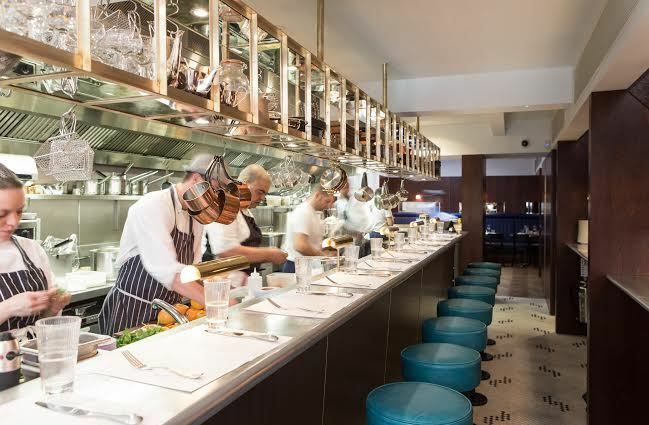 While Machneyuda is set within a bustling food market and sees diners closely packed around communal wooden tables in what could easily be a produce-laden family kitchen (we haven’t been, but we’ve seen photos), The Palomar soaks up its less wholesome Soho surrounds to take on a slightly more grown-up feel. 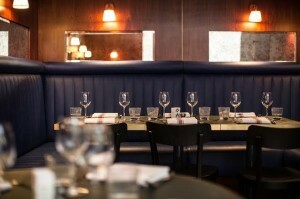 A large bar area runs along one side of the squishy, narrow restaurant, doubling up as the kitchen pass, while blue leather banquettes hug any remaining wallspace and extra tables slot in just about anywhere there’s room. At full capacity (which we reckon it will be most of the time), the tight squeeze leads to a bustling energy that’s as exhilarating as picnicking on the Northern line at rush hour but much more fun. Given the hip DNA of the place, you might have already assumed that small plates are the chosen way of eating. The influences that go into them are the more interesting part: as well as Israel it factors in flavours from southern Spain and Italy, North Africa and the Levant. We begin, as should you, with kubaneh, a traditional Jewish slow-cooked bread that here is brought to the table still steaming in its cooking pot and turned out onto paper, along with a tomato and a tahini dip. A sort of brioche but lighter and fluffier, it’s a good first impression. From here on in, the menu is split roughly between the raw bar (confusingly, the dishes aren’t all raw, but are served cold) and those cooked on the stove or grill and served hot. From the former we try a gilt head bream fricassée comprising raw slithers of fish in a slightly crisped bun packed with soft potatoes, a quail egg and capers, spritzed with fresh lemon juice. A sashimi sandwich, if you will. Bright and intricately flavoured, it’s an awakener for the senses. 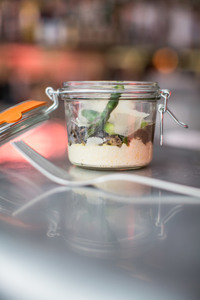 From the hot selection comes a kilner jar of polenta served ‘Jerusalem style’, a signature of Machneyuda and surely very soon a classic here too. It comes topped with asparagus, parmesan and an earthy mushroom ragout, drizzled in luscious truffle oil. If you’ve ever claimed not to enjoy polenta, or to find it bland, then come here to be converted. Silken and stupidly rich, it's transformed from a stodgy accompaniment to a stunning star act. We dare say that polenta restaurant La Polenteria down the road could learn a thing or two. Shakshukit is described on the menu as a ‘deconstructed kebab’. Warm, tender minced lamb spiked with parsley is ladled over cold yoghurt, drizzled with tahini and served with pita. It’s a sensorially exciting dish built on contrasts: while the mince is almost cloyingly rich, warm and with bite, the yoghurt is refreshingly acidic, cool and smooth. We also enjoy smoky grilled sardines made enchantingly exotic with oranges, coriander and spices, and a heartier onglet steak which comes with a fried egg and bone marrow butter. While the meat is meltingly soft, the butter unfortunately is frozen. An irritating yet easy mishap for a new and busy kitchen to make. Desserts note a return to flawless form, with a semolina cake steeped in orange syrup ensuring The Palomar’s aromatic flavours last to the end. A cocktail (Adonis) blending sherry, vermouth and orange bitters is equally punchy, at once playful and sophisticated. A list of several more suggest that light and refreshing is the route they’ve gone down. There’s also ample choice in the wine department, with around 10 each of red and white as well as a good few sherries, though we’d have liked to have seen Israeli wine (of which some is extremely good) make an appearance on the list. The Palomar is culturally exciting, culinarily exhilarating and run by people whose passion is evident with every interaction. It’s a boost to Soho’s scene and a restaurant which could and should become a landmark one for London. What’s more, it’s pretty affordable. The ‘small plates’ are nowhere near as small as some, and range from a fiver to only just over a tenner. If you factor in how much you’ll save on a flight to Israel, that really is a bargain. The Palomar is at 34 Rupert Street, W1D 6DN. Disclaimer: We review anonymously and pay for all our meals/drinks. Photos courtesy of the restaurant.